Kenya Prisons picked their second win at the ongoing Africa Club championships with a win over Nkumba University from Uganda. 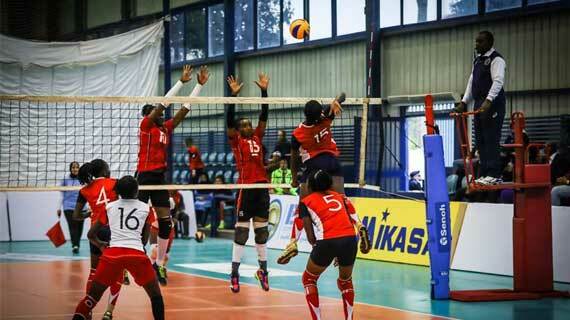 Kenyan volleyball champions Kenya Prisons had to fight from behind to bag their second victory over Ugandan side Nkumba University at the ongoing Women's Africa Volleyball Club Championships in Cairo, Egypt. Prison struggled in the opening set falling 26-24 but later recovered to push the University students for a 25-27 win albeit through hardwork . Back in their element, Josp Barasa's charges minimized their errors to beat Nkumba 16-25 in the third set for 1-2 lead setting the pace for a better final set. They then completed their day's assignment with a 22-25 fourth set win to bag the Group D match victory 1-3 (26-14, 25-27, 16-25, 22-25). In pool 'C,' neighbors Rwanda Revenue Authority went down to West African side FAP (Cameroon) in straight sets registering a 100 per cent loss in the Championships. After putting up a fierce fight and losing the first set 30-28, the Rwandese's morale dropped, letting go the second and third sets 25-19 and 25-16 respectively.